You can also hear several montages of his work in commercials at JerryImmel.com. Jerry grew up in Cleveland in the mid-1950s and in Philadelphia from 1956 to 1959.  He made these recordings using a reel-to-reel tape recorder with an audio cable connected directly to the TV receiver, which accounts for their very high audio quality. While in Philadelphia he also captured audio of station sign-offs from New York City, Baltimore, and other locations. All the dates listed for the clips are approximate, unless an exact date is listed. None of these have the National Anthem and some mention the NAB's Seal of Good Practice (SOGP). NOTE: The video files featured on this website are taken from my VHS home recordings of over-the-air and cable video captures, and from clips contributed by others. The quality varies from clip to clip, due to TV reception and recording issues. None of the clips that are featured here have been authorized by the various television stations, networks or any other entity. Graphics, design and descriptions copyright 2018 by J. Alan Wall. All rights reserved.